I’ve encountered many texts about Indigenous Australia recently but the most radical and original thinker has been Japanese historian Minoru (Mino) Hokari. Hokari was just 32 when he died of lymphoma in 2004 but he left startling insights into Australian Aboriginal history. He spent much of his doctoral research in the late 1990s and early 2000s immersed in the culture of the Gurindji people of NT. 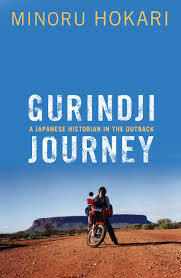 The fruits of that research came out in his challenging book Gurindji Journey: A Japanese Historian in the Outback. The cover of the book shows Hokari on his motorbike posing in front of Uluru. Gurindji country is in the north west of the territory, 1,689km by road from the iconic rock. The cover is misleading, the book is about the learning Hokari picked up in Gurindji homeland not the adventures of an outback tourist. Gurindji country is most famous for Wave Hill Station. Wave Hill was the site of the famous walk off by Vincent Lingiari and others in 1966 (immortalised in the Paul Kelly song From Little Things Big Things Grow). The Gurindji walked off the British-owned property in a pastoral strike, and set up their own community 20km away at Daguragu. The strike led to a nationwide land rights campaign and eventually a grand ceremony in 1975, attended by Prime Minister Gough Whitlam, to commemorate the return of some of their land. Gurindji People lived in the Victoria River region for thousands of years before whites established the first cattle station in the 1880s. The newcomers named it Wave Hill and British agribusiness giant Vesteys (which started as a Liverpool butchery) bought it at the start of the 20th century. By the 1930s Vesteys grew the property to 25,000 sq km of agricultural land carrying 50,000 head of cattle. Vesteys needed a workforce to serve their growing business and lured the dispossesed Gurindji back with beef, flour and tea. They became stock workers, a cheap labour force living in poor conditions. Hokari deals with this history briefly, but he is less concerned with objective facts than in Aboriginal views on their history. We go down strange pathways where we hear of the rainbow snake, Captain Cook, a many-limbed man-monkey named Jacky Pantamarra, and President Kennedy (the “Big American Boss”) . White academic history tells us neither Cook nor Kennedy ever visited the Northern Territory but Hokari wants us to accept the possibilities according to Gurindji history. These distinctions require careful listening and attentiveness. Hokari was accepted among the Gurindji, not because he was Japanese (he remained a ‘kartiya’ or white man) but because he immersed himself in their culture with anthropological zeal. Hokari’s teacher was an old man called Jimmy Mangayarri (who tragically died around the same time as Hokari). Hokari didn’t have to ask Old Jimmy any questions – Jimmy had his own agenda to teach. Mangayarri, said Hokari, had a talent for analysing Australian colonial history, the origin of Europeans and a knowledge of what was the ‘right way’ or ‘earth law’ to follow. Jimmy used five words to convey his meaning of life. These were ‘earth’, ‘Dreaming’, ‘law’, ‘right way’, and ‘history’. The words are interchangeable and interlocking and relate to the morality of the world and people’s place in it. The Gurindji concept of home is the country itself, filled with various ‘rooms’ they use on different occasions. It is a shared space and something you do not ‘own’ but are a part of. The origin of this timeless world is the Dreaming: the ‘everywhen’ that spins a web of connection without a centre. In Gurindji cosmology the ‘self’ is partly of a whole intimately connected to other beings, other countries and other community members. Jimmy told Hokari about the ‘right way’ which blurred the line between movement and law. “You look round,” he told Hokari. “Sun go down that way (west), sun get up that way (east), this is the right way”. Jimmy would always draw lines in the sand with a stick going west to east to show the direction of ‘the right way’. His right way includes a geographical Dreaming track as well as ethical behaviour. It is also a lifetime long education path; ‘a big high school’ in time and size. Captain Cook wasn’t the first Kartiya to encounter Aborigines. That was another Englishman named “Keen Lewis”, more commonly known by the Aboriginal name “Jacky Pantamarra”. Lewis or Pantamarra evolved from a monkey-like creature with four arms or four legs and it was he who he bred the kartiya. Pantamarra wrote a book with ‘silly ideas’ such as colonisation. Starting out with slings and arrows he learned how to use a rifle and eventually came to Australia claiming it as his own country. Pantamarra beat his wife and brought alcohol, becoming the origin of all bad ideas. Jacky Pantamarra, his name a sarcastic rejoinder to the 19th century European discriminatory name for Aborigines (“Jacky Jacky”), encapsulates the history of all Europeans who came to Australia. Pantamarra is dead, but his story can appear any time, mimicking the temporal-free structure of the Dreaming to make a point about Europeans. Those that survived shoot ’em time were eventually enticed back to the stations to work for Vesteys. The men found dignity in working with cattle, something they deeply enjoyed even when conditions were poor. Old Wave Hill station was washed away in a 1924 flood, which Jimmy said was started because a Gurindji made a rainstone during a drought which he gave to a rainbow snake in a waterhole. He got the rain but it became a big flood. Jimmy’s story shows how Dreaming beings are as active as humans in history. It was the Gurindji way of showing Kartiya they could control the weather. A new Wave Hill station was built after the flood. The well-travelled Vesteys stockworker, Sandy Moray Junganaiari, began to thinking of a better way of living. He called meetings of elders. “What’s for we work’n langa kartiya?” he asked them. “We wanna fight the kartiya. Get the country back!” Sandy Moray was too old to lead the revolution but he had planted a seed in Lingiari and others, which germinated after the Pindan walk-off in the Pilbara in 1946. The Gurindji needed allies and they sought the help of journalist Frank Hardy and the Northern Australian Workers Union. Assisted by black unionist Dexter Daniels, Lupna Giari (better known as Captain Major) began the strike at Newcastle Waters which was followed at Wave Hill. Lingiari faked an injury to be in Darwin Hospital where he met Daniels and planned the campaign. While it was publicly called a ‘strike’ to get the union involved, the action was really a walk-off. The Gurindji had no intention of coming back. The union and Hardy weren’t their only allies – they also had the ‘Big American Boss’ President Kennedy. For Jimmy and other elders, America was a place where people lived in good country. They were moral Europeans and were not like English kartiya. Jimmy said that during “Vestey Time” someone saw a huge airplane arrive on Wave Hill airstrip. There was a star mark on its tail and was so big there were two cars loaded inside. The visitor was President Kennedy who met Sandy Moray and Lingiari and agreed to support them. “You gotta your country back soon,” Kennedy told Moray. Kennedy started ‘the biggest war’ in order to kill the kartiya. Hokari wonders if this was an Vietnam allegory or the Gurindji seeking outside support to help realise their project. On 23 August 1966, the Gurindji moved off the station to Wave Hill Settlement where they sat out the wet season. When the Dry came in 1967 they moved to Wattie Creek, where they now remain. Vesteys refused to leave, but the national campaign launched by Lingiari, Captain Major and others had effect. For eight years they occupied Wattie Creek until they struck a deal with Vesteys in 1975. It is recognised as a landmark achievement in Indigenous rights.